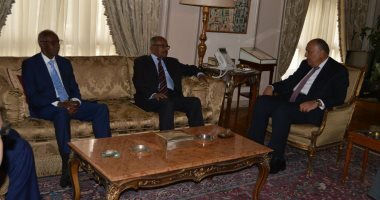 Foreign Minister Sameh Shukri on Wednesday received Eritrean Foreign Minister Osman Salih and political advisor Yamane Ghebreab. The meeting discussed the implementation of joint cooperation projects between the two countries as well as a number of regional issues of common concern. The Minister of Foreign Affairs, Advisor Ahmed Hafez, said that the meeting started by stressing Egypt's interest in developing bilateral relations with the brotherly state of Eritrea in all fields to meet the aspirations of the peoples of the two countries as well as looking forward to the visit of Eritrean President Isaias Afwerki as soon as possible in order to give a boost. Strong bilateral relations. Hafez added that the two sides discussed joint cooperation projects in a number of priority areas for the Eritrean side, overcoming all challenges such as setting up a fish feed factory, setting up two power plants, cooperation in fishing and implementing a number of infrastructure projects, To study the signing of a memorandum of understanding concerning the exchange of visa exemptions for official passports between the two countries. Minister Shukri affirmed Egypt's keenness to overcome all obstacles facing these projects. The Spokesman noted that the meeting also dealt with a number of regional issues such as the security of the Red Sea, the regional situation and means of achieving security, stability and cooperation in the Horn of Africa. For his part, the Eritrean Foreign Minister stressed the depth of the historical relations between the two countries and his country's aspiration to develop them in all fields, in addition to emphasizing Eritrea's aspiration to achieve security, peace and stability in the Horn of Africa.